High quality and strength cementitious gray mortar, suitable for laying bricks, cement blocks, paving stones and slabs as well as natural stones. 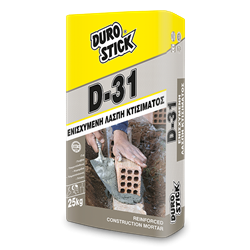 Ensures triple resistance to moisture and double adhesive strength when compared to traditional mortars. It ensures unique resistance against impacts and vibrations, whether natural or generated from excavation equipment operating in adjacent spaces. Indicatively, for 9x6x19cm bricks, approximately 20kg per m² of mortar.